Benny Sings is coming back to New York in June! Plans include a showcase concert and a gig at Northside Festival. 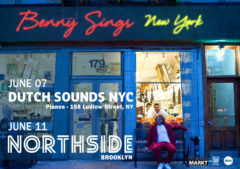 Benny Sings appears at Northside Festival alongside headline acts such as Brian Wilson, Questlove, Peanut Butter Wolf, Conor Oberst, Wolf Parade, King Khan & the Parades, Machinedrum and Oddisee. Besides music, the festival also features art, discussion and innovative industry. Today, Benny Sings is also announced for Deep in the Woods. Benny will play at this festival in Belgium’s vast Ardennes on 3 September. Festival-goers are transported back over several days to the roots of musical experience.